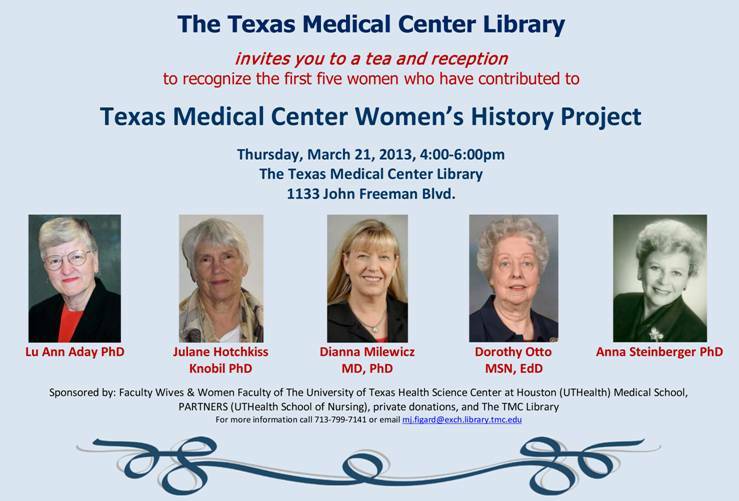 The Texas Medical Center Library invites you to a tea and reception to recognize the first five women who have contributed to the Texas Medical Center Women’s History Project. The reception will be held on Thursday, March 21, from 4:00-6:00 pm at the Texas Medical Center Library, located at 1133 John Freeman Blvd. For more information, please see the flyer below! This entry was posted in Announcements on March 7, 2013 by Alison.